EBG Helicopters | Helicopter tours, charters and pilot training (PPL and CPL). 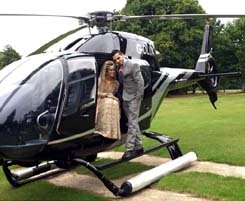 Whatever the occasion let us get you there in style! Call us for a quote on 01737 823 179! Experience London like never before! The perfect present, the gift of flight. Choose from one of our scenic Tours. Get your PPL(H) or type rating with EBG. Call us on 01737 823 282 now! 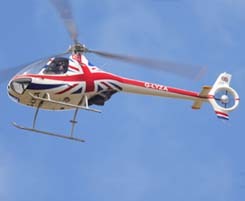 EBG (Helicopters) Ltd is a helicopter charter and training company who have been successfully trading since 1999. In 2010 we expanded into Helicopter Engineering with EBG Helicopters (Sales & Maintenance) Ltd.
Our charter fleet consists of: two Robinson R44's, and two Eurocopter EC120’s. We also operate two R22 Beta 2 helicopters for training and trial lessons, a brand new Cabri G2 Gumbal and a third Robinson R44. 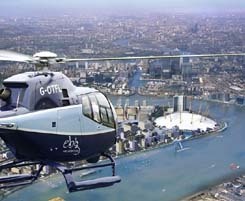 EBG Helicopters has a dedicated team to assist with arranging a London sightseeing flight, starting you off on the private pilot training route or providing self-fly-hire helicopters. Call us today.